So, do you always feel yourself falling behind on your projects? Establishing a schedule will help! Seriously, I have made such great strides by following even a very haphazard schedule, and it’s only going to get better. What’s more, it’s really easy to get started with, and can be expanded upon over time. 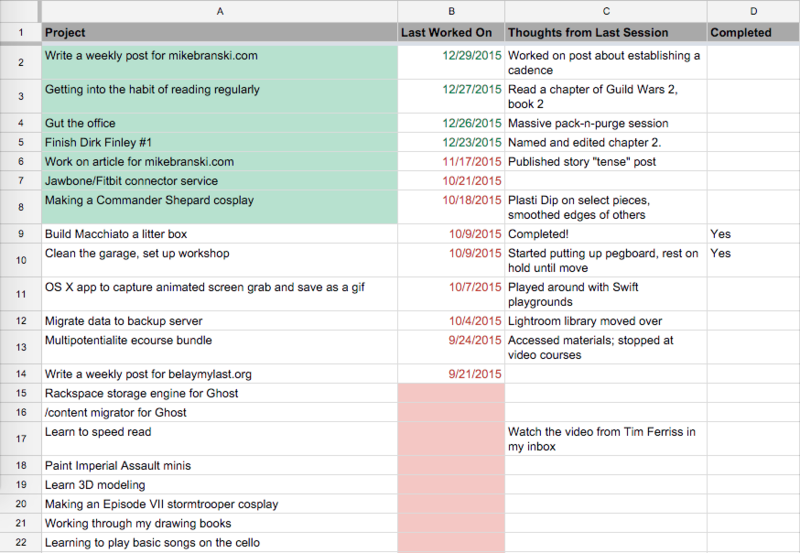 I began to combat this endless loop by creating a spreadsheet of interests. In it, I make note of whatever idea comes to mind, no matter how simple, ridiculous, or abstract it is. Then I mark down the date each time I worked toward that goal, as well as a few words (never more than a sentence) of what I accomplished, replacing the previous session’s entry. This part was key, as I would often come back to something after months and not remember where I left off, and having this little reminder is enough to kick-start my progress the next time around. I replace the previous note because I don’t want to get bogged down in a log for each project, choosing instead to focus on where it’s at as it exists today, as well as what I need to do going forward. 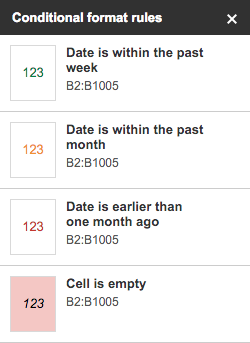 Once I had that set up, I searched for a way to keep the “Last Worked On” column always sorted most recent first. Not finding a built-in means for doing so, I created a Google Sheets script to keep my column sorted. I then color coded the “last worked on” column to quickly show how fresh the project was: green for ones worked on in the past week, yellow the past month, red for anything older, and a red background callout for any that haven’t been started. Okay, great. So I have this beautiful(-ish) spreadsheet that tells me everything I want to know about my projects, but what good is it if the work doesn’t get done? I have been using the Pomodoro technique on and off to make headway in my various projects, but that isn’t always enough. With writing, for instance, I’ve found it all too easy to shrug off my daily goals because they “take too long”, and always break out of a single 25 minute productivity session (at least when I’m creating content, as I find editing is easier to chunk into smaller segments). So what to do? The way I am taking to get around this new hurdle is to schedule written content out in advance, and what’s great is this can be applied to this blog, Belay My Last, and my novel. For blogging, I am establishing a weekly cadence to get a post out every Wednesday, something my readers can count on with consistency. In the beginning, I might alternate it so this site and Belay My Last are on opposite weeks, with the goal of getting both to have weekly updates as I become more comfortable and find rhythm. My noveling could receive a similar treatment. As I expand my content here, more and more posts gravitate toward writing. It could be that I create a bi-weekly or monthly newsletter, giving readers updates on the latest from my novels, provide sneak peeks and bonus chapters, and reward loyal fans with exclusive deals and free content. If I have stuff to talk about in between, that could appear as posts here. My only concern with that is I would like to continue writing about other things, such as costuming and development, but I will cross that bridge if and when the time comes. It could be they co-exist with my noveling posts just fine. Don’t create problems you don’t have, and all that. It’s okay to fall off the tracks. Heck, look at my projects sheet above: there are a ton of things in the red! Your interests will ebb and flow, but don’t lose sight of what really drives you. It’s okay if that shifts over time, but never stop doing. You can plan all you want, but chances are if you’re never creating, you won’t be satisfied with what you’re doing. So get out there, and find your cadence. As I was setting up my weekly repeating calendar reminder to publish every Wednesday (which I highly recommend doing), I realized my time-to-live for each post would be rapidly enhanced if I wrote up a snippet for sharing on social media ahead of time. I’m going to bake this into my routine so I don’t have to think about it when it comes time to release my next post.